« Sutton Aesthetics now offers Microblading! This entry was posted in Smart Skin Blog and tagged after the shave, cleanser, just for men, men's skin care, sunscreen, sutton ageless for men, the age defense, toner. Bookmark the permalink. Follow any comments here with the RSS feed for this post. Post a comment or leave a trackback: Trackback URL. Men are considered rough and tough but their skin requires as much care as women’s do. It is all about getting into good habits with good products. When you cleanse and moisturize daily, you are feeding your skin with nutrients that build healthy cells. The ingredients that are in face washes and moisturizers not only make the skin look and feel younger but they fight free radicals (damaging effects of the environment including the sun). 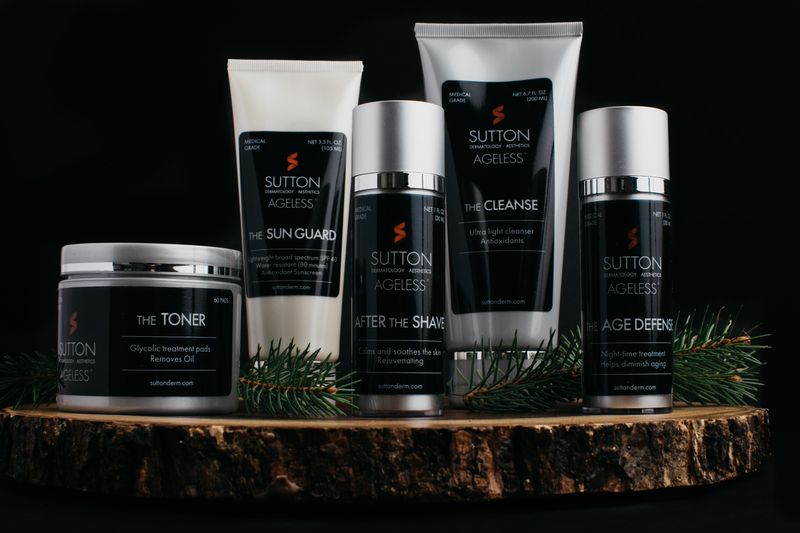 There are certain skincare essentials which every man should have at their disposal and this is why we created our men’s line, Sutton Ageless for Men. the CLEANSE: Bar soap is a staple in many homes, but when it comes to your face you want something specifically designed to delicately handle dirt and debris. The CLEANSE is a gentle, soap-free cleanser that delivers moisturize and skin softening benefits in a non-drying formula. the SUN GUARD: If you think you don’t need sunblock after summer, think again. Your skin still needs adequate protection to prevent sun damage such as wrinkles and fine lines. The SUN GUARD is a lightweight cream that delivers broad spectrum UVA/UVB SPF 40 water-resistant protection, rich in antioxidants for a complete sunscreen. the AGE DEFENSE: Using an anti-aging cream preventatively, not proactively, will deliver the best results. The AGE DEFENSE is a clinically proven retinol serum which pairs a time-released, patent-pending delivery system, with green tea polyphenols. It has a micro polymer delivery system that stabilizes and protects retinol to continuously drive retinol into the skin. the TONER: Toner isn’t always the first thing you think of when creating a skincare routine – too often it gets left out entirely but you should be using one because the benefits are great and the effort is minimal. Since toner removes excess oil from your skin it can do wonders for keeping your pores clean and preventing breakouts. The TONER are convenient and easy to use Glycolic Acid (10%) treatment pads that promotes smoother skin by gently exfoliating, moisturizing and assisting in the removal of oils and residue on the skin. AFTER the SHAVE: Putting good ingredients on your skin after shaving can make your shaving experience more pleasant. AFTER the SHAVE has three powerful antioxidants combined in this moisturizing formula clinically proven to calm and soothe skin, visibly reducing the appearance of redness, fine lines, wrinkles, puffiness, and pore size. Visit suttonderm.com to purchase your men’s products.